December 4, 2008 By John P.
I was entertaining myself for hours this evening while perusing all of the crazy ways man has invented to move himself from point A to point B. After we mastered the most efficient methodology, apparently we turned our attention and energy towards also creating the most inefficient methods possible. Why would we do this? Well, beyond the very basic primal need for horsepower… I’m guessing there was either a bet or a dare behind most of these creations. Either that, or they built em to attract the chicks! Let’s kick this off with an 1,100 pound machine by Jake Lyall called the RIOT (Re-Invention Of The) wheel. 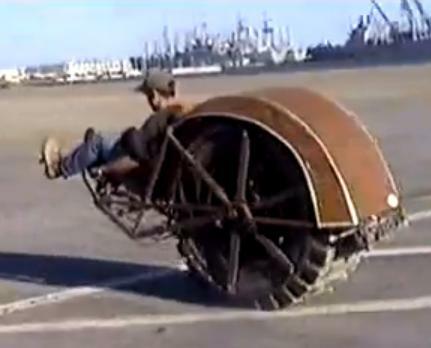 Lyall’s monowheel is unusual because it does not use the rider’s weight to provide the reaction to the engine’s thrust on the wheel. Instead the rider is outside, and the reaction is given by a lead-weighted Honda 80cc 4-stroke scooter engine suspended from a central shaft, driving through a sprocket attached to the wheel spokes. A separate 450-pound counterweight keeps the rider hovering above the ground at the front. Steering is done partly by precessing a 65-pound gyroscope to give yaw, and partly by the rider shifting his weight. Next is the WL-16IV, for Waseda-Leg No.16 Refined IV, a walking chair developed in a Japanese university. Mojo Motorsports builds the 30 MPH Revolution. It’s available now for $1,000 including shipping… if you’re brave enough to ride it. The Frankenscooter was built with the purpose of being “…AS RATTY, UGLY AND FUNNY LOOKING AS POSSIBLE”. I think they succeeded. The Timberjack Walking Machine is used in to fell lumber. As I understand it, it’s from a defunct division of John Deere. Wonder if I can pick one of these up on eBay? The Hubo FX-1 was made by the Humanoid Robot Research Center of South Korea. The development concept is that the robot can walk naturally with carrying a person or a load of 100kg, so the lower body takes after legs of human and the upper body takes after a chair. In case you ever felt your legs were getting too much exercise riding a bike the normal way, you can pick one of these up and pedal backwards. The Mondo Spider was made by a group of Canadian artists: Jon Tippett, Charlie Brinson, and Alex Mossman. They all live in Vancouver, BC. You crazy Canadians! Eh? The RIOT looks almost exactly like the Brute Chopper in Halo 3, except the Brute Chopper drives in the opposite direction (the wheel is in the front).